Latisse users can expect to experience longer, fuller and darker eyelashes in as little as eight weeks, with full results in 16 weeks. To maintain effect, continued treatment with Latisse is required. If use of Latisse is discontinued, eyelashes will gradually return to where they were prior to treatment over a period of weeks to months (average eyelash hair cycle). Latisse was clinically tested in a pivotal Phase III, multi-center, double-masked, placebo-controlled study to assess its safety and efficacy in which all endpoints (improved eyelash prominence, length, thickness and darkness) were met. Bimatoprost, the active ingredient in Latisse, was first approved in 2001 as a medical product to lower intraocular pressure in people with open-angle glaucoma or ocular hypertension. Patients treated with bimatoprost for this specific eye condition experienced eyelash growth as a side effect. The long-term safety of bimatoprost for therapeutic use has been recognized by the medical community and well established based on use in 32 clinical trials involving more than 5,700 glaucoma patients and more than 13 years of clinical trial experience. Given the existing and substantial clinical and post-marketing safety data with bimatoprost solution 0.03%, coupled with the positive results from the Phase III Latisse study, Latisse provides patients a clinically meaningful aesthetic benefit with a favorable safety profile. Bimatoprost is the active pharmaceutical ingredient in the formulation of Latisse and is a structural prostaglandin analog, a lipid compound derived from fatty acids designed to bind to prostaglandin (PG) receptors. PG receptors are present in hair, particularly in the dermal papilla and outer root sheath. Although the precise mechanism of action is unknown, PG receptors are thought to be involved in the development and regrowth of the hair follicle by increasing the percent of hairs in, and the duration of, the anagen or growth phase. Read the Patient Information that comes with Latisse before you start using it and each time you get a refill. There may be new information. This leaflet does not take the place of talking with your physician about your treatment. 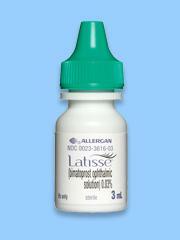 Latisse solution is intended for use on the skin of the upper eyelid margins at the base of the eyelashes. DO NOT APPLY to the lower eyelid. If you are using Lumigan or other products in the same class for elevated intraocular pressure (IOP), or if you have a history of abnormal IOP, you should only use Latisse under the close supervision of your physician. The most common side effects after using Latisse solution are an itching sensation in the eyes and/or eye redness. This was reported in approximately 4% of patients. Latisse solution may cause other less common side effects which typically occur on the skin close to where Latisse is applied, or in the eyes. These include skin darkening, eye irritation, dryness of the eyes, and redness of the eyelids. Latisse solution is packaged as a 3 mL bottle of solution with 60 accompanying sterile, disposable applicators. The recommended dosage is one application nightly to the skin of the upper eyelid margin at the base of the eyelashes only. Once nightly, start by ensuring your face is clean, makeup and contact lenses are removed. Remove an applicator from its tray. Then, holding the sterile applicator horizontally, place one drop of Latisse on the area of the applicator closest to the tip but not on the tip. Then immediately draw the applicator carefully across the skin of the upper eyelid margin at the base of the eyelashes (where the eyelashes meet the skin) going from the inner part of your lash line to the outer part. Blot any excess solution beyond the eyelid margin. Dispose of the applicator after one use. DO NOT APPLY in your eye or to the lower lid. ONLY use the sterile applicators supplied with Latisse to apply the product. If you miss a dose, don’t try to "catch up." Just apply Latisse solution the next evening. Fifty percent of patients treated with Latisse in a clinical study saw significant improvement by 2 months after starting treatment. If any Latisse solution gets into the eye proper, it is not expected to cause harm. The eye should not be rinsed. Don’t allow the tip of the bottle or applicator to contact surrounding structures, fingers, or any other unintended surface in order to avoid contamination by common bacteria known to cause infections. Store Latisse solution at 36° to 77°F (2° to 25°C). This leaflet summarizes the most important information about Latisse solution. If you would like more information, talk with your physician. You can also call Allergan’s product information department at 1-800-433-8871. For more information, please visit www.latisse.com.